Experience a new high standard of cooking with this carbon steel frying pan featuring a patina coating that seals in the seasoning every time you cook. Simply oil and season the pan a few times before use in order to build up a non-stick coating so that food will easily be released from the pan when cooked and food debris will slide off for effortless cleaning. It has an induction base so it is suitable for all hob types and is even safe to use in the oven so you can cook like a professional. 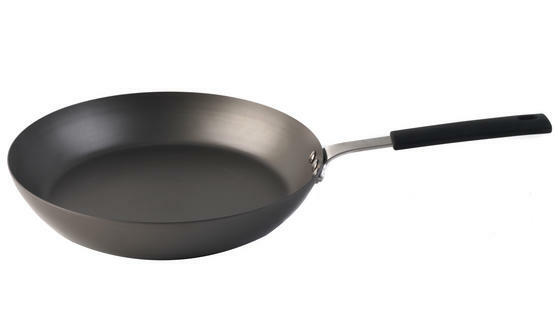 This fantastic Giles and Posner Frying Pan for Life is suitable for use with metal utensils and will instantly enhance your cooking. Measuring 44.70 x 24 x 4.20 cm, this frying pan is made from high quality carbon steel so it is wonderfully durable and long lasting. The pan has a strong, pressed stainless steel handle with an easy grip layer which is great for safer, more secure cooking and lifting. To allow the patina coating to build up and naturally enhance the flavours of your food, simply wipe the pan with a cloth after use. Season the pan to create a patina non-stick coating, it will get darker as this builds up - the darker the pan, the better it performs.